I recently made Rice Krispie Treats. 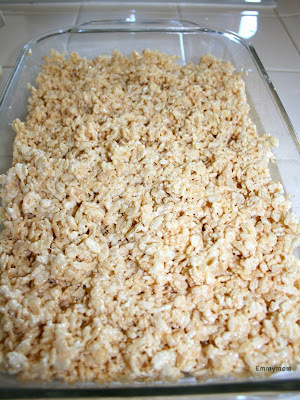 Did I tell you, I have never made rice krispie treats in my life? I have eaten plenty... but somehow have never made them. I went to the store, figuring I could find the recipe on the back of the box of Rice Krispies. Do you know it isn't there anymore?? after all, they now sell individual prepacked ones. But, you can get the recipe on the web site. Oh the gooey goodness. I hope you enjoyed them. Did you know you can add things like m&m and skidles yummy yummy. Homemade are so much better then the boxed ones. You have led the sheltered life. haha. I am not sure my kids would eat them, they are sooo strange. I do my extras would! Hmmmmm...I may be making these when we come back from TX. I want to eat that right off her finger, it looks so good! I love homemade ones and I am glad you have finally had the opportunity to make your own! Sometimes I wonder why I even bother putting them in a pan and just eat them out of the bowl! Yum! i JUST made them for the first time this past may. too gooey for my liking. didn't like how everything stuck to everything. i do enjoy eating them though;-) i'm more of a "chocolate butterscotch-e-roo" kind of gal. gotta love karo syrup to make all of the stickiness stick to itself and not you! Another fun thing to do is sprinkle them with seasonal sprinkles. That makes them cute. Now I'm in the mood for them too! Mmmm. I always add a handful of chocolate chips. It makes them extra yummy! OMG she's BEAUTIFUL! Love this pic and yum! Send me some!! I am about to post some winners of my giveaway and you won something!! Come check it out!